A while back, I was tagged by Jennieboo for the Google meme. 4) Repost (w/ a link) the picture of the oddest, craziest, strangest, coolest, oldest, etc. person that shares your name. Post multiples if you find a few you like. 5) Pass it on to at least 5 other people. So…I typed in my full name and got…oh pretty much nothing. Well, I wouldn’t say nothing, just nothing that would fit the meme. For reasons unknown to me, I got images of everything from cakes, flowers, musical instruments and elephants. Go figure. About the time I switched back over to Susan from being called Sue, the movie “Desperately Seeking Susan” came out. It nearly made me want to go back to being called (A Boy Named) Sue again. I just couldn’t win! 1. Frances~who started She Who Blogs and goes out of her way to encourage and support everyone. Plus she has some amazing shots of NYC. 2. Tink~ Because she is just so wonderful to everyone. Besides she cracks me up every time I go to visit her. 3. 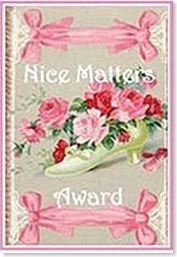 My Mom~Because, despite the fact that she is an inconsistent blogger, the award reminds me of a fancy Mother’s day card. And…well…she is my mother. What do you mean I can’t give out awards based on who I think will like the pink the most? All is says in the rules is that they have to be nice and inspire good feelings! PS Pop by my page when you have a minute, I have a surprise for you. Congrats on a very fitting award. As to the name, I didn’t know a single Kelley until I went to college, then there was someone with the same first and last name in the college cheerleader calendar. You can imagine the phone calls I got. But you deserve it cause you are nice! Thank you, Susan. I think you’re pretty nice, too. Damn. I was going for the “Mean” award. Thank you!! You are such a nice person. Oh, yuk, yuk, yuk. I need to take a bath! I googled my name and the only match came up as a woman in Wisconsin who was convicted of abusing her kids. She is appealing the verdict because she did not get a speedy trial. This is doubly troubling because I used to live in Wisconsin, although my last name was different then. I dont like giving out awards either. It’s jsut to hard to choose. Haha, Dorky Dad got a girly award. I was glad not to see a picture of the real me on Google images. Surprising how many people have our names. Glad your enjoyed the google meme. I’ve got to make a separate page on my blog for these goodies. Excellent! Totally not enough pink in my blog.